To Cite: Fattahi A, Zaini F, Kordbacheh P, Rezaie S, Safara M, et al. Evaluation of mRNA Expression Levels of cyp51A and mdr1, Candidate Genes for Voriconazole Resistance in Aspergillus flavus, Jundishapur J Microbiol. 2015 ; 8(12):e59927. doi: 10.5812/jjm.26990. Background: Voriconazole Resistance (VRC-R) in Aspergillus flavus isolates impacts the management of aspergillosis, since azoles are the first choice for prophylaxis and therapy. However, to the best of our knowledge, the mechanisms underlying voriconazole resistance are poorly understood. Objectives: The present study was designed to evaluate mRNA expression levels of cyp51A and mdr1 genes in voriconazole resistant A. flavus by a Real-Time Reverse Transcriptase Polymerase Chain Reaction (RT-PCR) technique. Materials and Methods: Five A. flavus isolates with resistance to VRC were examined by a RT-PCR approach. Results: Four out of five isolates revealed cyp51A and mdr1 mRNA overexpression. Interestingly, the isolate, which was negative for cyp51A and mdr1 mRNA expression showed a high voriconazole Minimum Inhibitory Concentration (MIC). Furthermore, a computational-based analysis predicted that voriconazole resistance could be mediated through cooperation with a network protein interaction. Conclusions: Our experimental and in silico findings may provide new insight in the complex molecular pathways of drug resistance and also could assist design an efficient therapeutic strategy for aspergillosis treatment. Copyright © 2015, Ahvaz Jundishapur University of Medical Sciences.This is an open-access article distributed under the terms of the Creative Commons Attribution-NonCommercial 4.0 International License (http://creativecommons.org/licenses/by-nc/4.0/) which permits copy and redistribute the material just in noncommercial usages, provided the original work is properly cited. Invasive Aspergillosis (IA) is widespread in immunocompromised individuals and has become a great concern for the management of such patients (1, 2). Although Aspergillus fumigatus is responsible for the majority of IA, emerging epidemiological reports have suggested an increase in the frequency of non-fumigatus isolates including A. flavus (3-7). Aspergillus flavus is the second most common Aspergillus spp. causing IA (2, 8). Until now, therapy for IA has been limited to azoles, echinocandins and polyenes. The use of voriconazole has improved the treatment of invasive aspergillosis. Voriconazole blocks ergosterol biosynthesis by inhibiting the activity of 14-α-lanosterol demethylase (CYP51A1), a cytochrome P450 enzyme involved in the conversion of lanosterol to 4,4-dimethylcholesta-8 (9),14,24-trien-3β-ol (9, 10). Voriconazole-resistant A. flavus was originally identified in a patient with IA, underlying a lung surgical operation (11). Recently, increasing Voriconazole Resistance (VRC-R) in clinical isolates of Aspergillus spp. has been reported worldwide (2, 11). Based on limited studies, the most obvious mechanism of VRC-R in A. flavus involves overexpression or mutations of cyp51A (11, 12). Several studies have suggested that multiple mechanisms unrelated to cyp51A undoubtedly exist. Furthermore, various studies from years 2006 to 2009 failed to detect genetic alterations within the cyp51A coding sequence in 40% of triazole resistant Aspergillus spp. (1, 13-15). The primary mechanism responsible for azole resistance in clinical Candida isolates is overexpression of Multidrug Resistance Efflux Pumps (MDR-EPs) (16, 17); upregulation of genes encoding MDR-EPs, contributing to triazole resistance in A. flavus have been previously described (18, 19). Two major classes of efflux proteins, the ATP-Binding Cassette (ABC) pumps and the Major Facilitator Superfamily (MFS) transporters have been shown to contribute to drug resistance (20-23). The present study was designed to evaluate the mRNA expression levels of cyp51A and mdr1 genes in voriconazole resistant A. flavus by a Real-Time Reverse Transcriptase-Polymerase Chain Reaction approach. Forty-five A. flavus archived strains isolated by a previous study were obtained from the Medical Mycology Laboratory, School of Public Health, Tehran University of Medical Sciences from January 2004 to December 2006. The Clinical and Laboratory Standards Institute (CLSI) M38-A3 microdilution method was used for assessment of the susceptibility of A. flavus strains to voriconazole (Ankleshwar [Gujarat], India). Candida krusei ATCC 6258 was used as a control strain for each plate (24, 25). All isolates were cultured on potato dextrose agar (Merck, Germany) at 35°C for seven days. Fresh conidial suspensions were collected and counted by hemocytometer; and the cell density was adjusted to 0.4 - 2.5 × 104 CFU/mL. Antifungal susceptibility testing was performed and Minimum Inhibitory Concentrations (MICs) were determined after 48 hours. Strains of A. flavus that demonstrated resistance to VRC as well as sensitive strains were selected for RNA extraction. Conidia from each strain was inoculated in liquid culture (Merck, Germany) and incubated at 30°C with constant shaking at 120 rpm for 20 - 24 hours. Subsequently, mycelia were collected at log-phase by filtration and washing thoroughly with sterile water. They were then frozen quickly in liquid nitrogen, and cell wall disrupted by pestle. Total RNA was extracted using the RNX-Plus Kit (Sinaclon, Iran). The quantity and quality of RNA were analyzed using nanodrop (ND-1000, Thermo Scientific Fisher, US). To avoid any genomic contamination, RNA was treated with DNase1 (Qiagen, Hilden, Germany), according to the manufacturer’s instructions. Treatment of total RNA with DNase1 improves the reliability of the quantitative method, considerably (26). cDNA synthesis was performed as previously described with some modifications (27, 28). Briefly, single stranded cDNA (sscDNA) was synthesized using 6μg RNA, 20 pmol/μL random hexamer (Fermentas, Burlington, Canada), 20 pmol/μL oligo-dT (Fermentas, Burlington, Canada) and 10 mM of dNTP mix (Fermentas, Burlington, Canada), then incubated at 65°C for ten minutes followed by addition of 20 U Ribolock (Fermentas, Burlington, Canada), 7.5 μL of 5X Reverse Transcriptase (RT) buffer (Fermentas, Burlington, Canada) and 200 U Moloney Murine Leukemia Virus (M-MuLV) reverse transcriptase enzyme (Fermentas, Burlington, Canada) and then incubated at 70°C for 10 minutes followed by incubation at 42°C for 60 minutes. cDNA was checked with ß tubulin (tubF 5′-GATGGCTGCTTCTGACTTCC-3′, tubR 5′-GGTCGTTCATGTTGCTCTCA-3′) primers (designed by the Primer 3 online software version 0.4.0 and synthesized by the Bioneer company, Korea) as part of housekeeping with the following PCR conditions: five min at 94°C; 30 cycles of 30 seconds at 94°C, 30 seconds at 55°C, 45 seconds at 72 °C, and seven minutes at 72°C. Real-time Reverse Transcriptase-PCR (RT-PCR) was carried out to determine the differences in expression patterns of identified genes between resistant and sensitive A. flavus isolates, using a CFX96™ Real-Time System (C1000TM Thermal Cycler) (Qiagen/Corbett Rotor-Gene 6000). In order to analyze the expression of cyp51A and mdr1 for voriconazole resistance in A. flavus, specific primers (Table 1) corresponding to the coding regions of cyp51A and mdr1 genes were designed by the Primer 3 online software version 0.4.0 (synthesized by Bioneer Korea). After cDNA synthesis, real-time RT-PCR was performed in 20 μL reactions containing 1 μL cDNA target, 100 Nm forward and reverse primers and 1x SYBR Premix Ex Taq™ (Takara, Tokyo, Japan). Experiments were conducted in triplicates. The PCR conditions were as follows: activation at 95°C for 30 seconds, amplification at 95°C for 5 seconds, 60°C for 30 seconds during 40 cycles. The relative value of the expression level of each gene was calculated by comparing the Cycle Thresholds (CTs) of the target genes with that of housekeeping genes (tub) using the 2 –ΔΔct method, as previously described (29). In order to analyze the Protein-Protein Interactions (PPI) the Search Tool for the Retrieval of Interacting Genes/Proteins (STRING) database version 9.1 (http://stringdb. org/) was used. The predicted networks relied on physical and functional interactions of A. flavus. Five out of 45 A. flavus tested isolates, according to the proposed interpretative breakpoints (24) with high MIC values in the presence of voriconazole, were defined as VRC resistant (Table 2).Three isolates, No 3, 4 and 5 were found to display the highest level of VRC-R (MIC, 16 μg/ml), whereas isolates 1 and 2 showed low levels of resistance. To verify the development of voriconazole resistance in the isolates, they were cultured on Sabouraud (SDA) agar containing progressively increasing concentrations of voriconazole (0.5 to 50 μg/ mL). aAbbreviations: MIC, minimum inhibitory concentration; VCZ, voriconazole. bSusceptible ≤ 1 μg/mL, Intermediate: 2 μg/mL, Resistant : ≥ 4 μg/mL. Five VRC resistant of A. flavus were selected for qRT-PCR experiments to study mRNA expression of the cyp51A and mdr1, a significant overexpression of cyp51A was found in four isolates (6.89 to 7.93 folds) (log2 P < 0.001) (Figure 1), whereas there was no significant expression of these gene in one. A variable expression of the mdr1 mRNA was detected in four samples. Moderate and high levels of mdr1 mRNA was observed in isolate number 1 (4.77) and isolates number 2, 3 and 4 (10.94, 11.09 and 18.12 fold, respectively) (log2 P < 0.001).In contrast, isolate number 5 at the highest MIC, did not express mdr1 and cyp51A. To determine which protein partners are implicated in the mechanism of A. flavus drug resistance by cyp51A and mdr1, we used the STRING database, as described in the materials and methods section. As shown in Figure 2, several important proteins were potentially associated with the expressed genes obtained from the real-time PCR. The potential biological functions of the encoded proteins by cyp51A and mdr1 showed their possible role, which could depend on their interactions with a network of other cellular proteins. A, The highest-scoring interaction partners of cyp51A. As the confidence scores for these interactions are very high, more specific protein partners are shown. B, The interaction network of mdr1 display several protein partners. In the present study, we evaluated mRNA expression levels of cyp51A and mdr1 genes, in five A. flavus isolates. Both genes seemed to contribute to the development of drug resistance in the four resistant isolates. So far, different mechanisms have been reported for the resistance to azoles in A. flavus including genetic changes and/or overexpression of cyp51A, cyp51B and cyp51C as well as decreases in the concentration of intracellular drugs. The latter mechanism could be a consequence of either overexpression of efflux pumps or due to reduction in drug penetration (2, 11, 18, 19). The patterns of voriconazole resistance appear to differ in different cases. Various studies have demonstrated that point mutations in the cyp51A gene encoding 14-sterol demethylase could be a major mechanism accounting for triazole resistance in Aspergillus spp. (14, 30, 31). However, it has been shown that 40 - 70% of VRC-R A. flavus failed to demonstrate cyp51 mutations (19). Over the past decade, extensive studies attempted to overcome mdr, as one of the major challenges in drug resistance of fungi. Moreover, it is now clear that overexpression of mdr1 has critical functions in human cancer treatment by reduction of the uptake and increasing the efflux of anti-cancer drugs (19). Our data demonstrated, a significant up regulation of cyp51A (6.89 to 7.93 folds) (P < 0.001) in four isolates, yetisolate number 5, at the highest MIC, did not express cyp51A and mdr1. It has been suggested that up regulation in azole target enzyme gene cyp51A is associated with azole resistance in A. fumigatus and A. lentulus (10, 32). In contrary to these reports, Liu et al. indicated that the expression levels of the azole target enzyme genes cyp51A, cyp51B and cyp51C were not associated with VRC resistance in A. flavus (2). However, their results are in disagreement with our findings (2). The lack of data showing an association between ABC or MFS multidrug efflux pumps and triazole resistance in Aspergillus, encouraged us to identify candidate efflux pumps that could be associated with azole resistance in A. flavus. In this regard, our data indicated significant differences in expression level of mdr1 between resistant and sensitive isolates. Moderate and high levels of mdr1 mRNA in four isolates mirrored MIC results with the exception of the fifth isolate, which exhibited no expression of mdr1 mRNA. Our results are in agreement with the report of Krishnan-Natesan et al. (11), which showed degrees of MDR-EPs over expression in all VRC-R isolates of A. flavus; the level of MDR- EPs correlated with the degree of resistance as reflected by the MICs of the drugs. They also showed that there were no alterations in the cyp51A as well as MDR-EPs overexpression in some isolates. Co-regulation (co-expression and co-silencing) of mdr1 and cyp1A was reported in various human malignancies. Lampen et al. determined the co-induction of mdr1 and cyp1 genes in human Caco-2 intestinal cells on treatment with carcinogenic aromatic hydrocarbons (33). 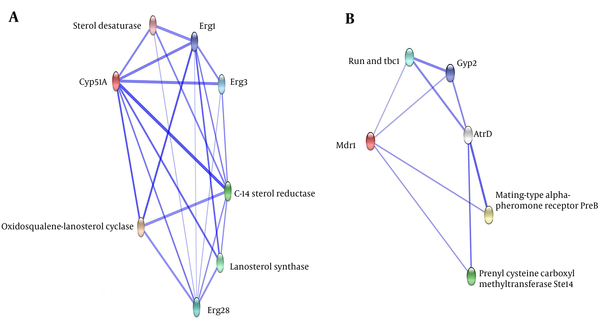 Finally, an in silico study was performed using the online STRING program; in order to estimate the potential biological processes of genes that act in ergosterol biosynthesis and efflux pumps (EPs) function. Studies have shown that the majority of biological processes are regulated through association of protein molecules. In addition, functional units of cells are often complex assemblies of several macromolecules, where proteins play a vital role. Therefore, protein–protein interaction networks play an important role in the organization of an organism’s life. At the highest confidence score, erg1, erg3 and erg28 Lanosterol synthase proteins were predicted to interact either directly or indirectly with the cyp51A (erg11) protein. Furthermore, Erg1 catalyzes the first oxygenation step in sterol biosynthesis and is suggested to be one of the rate-limiting enzymes in this pathway. The interaction of erg1 seems to be crucial for sterol biosynthesis. As shown in Figure 2, ABC a-pheromone efflux pump atrD, is directly or indirectly potentially associated with the mdr1. Furthermore, atrD as the efflux protein removes drug accumulated in the cell with the expense of energy and reduces the concentration of drug required for the inhibition of growth. The in silico results predicted that voriconazole resistance could be mediated through cooperation of protein partners interaction. Taken together, our experimental and in silico findings may provide new insight into the complex molecular pathways in drug resistance and could assist design an efficient therapeutic strategy for aspergillosis. Our data suggested that there are different scenarios that explain the biological significance of the expression of mdr1 and cyp51A in drug resistance, at least for our limited samples. There are two hypotheses: 1) Mdr1 protein regulates cyp51A mRNA expression via a positive dominant effect. This hypothesis comes from our findings, which showed that in the absence of mdr1, we could not detect cyp51A mRNA expression. The lack of mdr1 expression could have occurred due to gene deletion or other genetic and epigenetic phenomena. 2) Several unknown genes, loci and molecular pathways could play central roles in the development of drug resistance, which is known as a complex trait. Consequently, it is quite understandable that in the absence of cyp51A and mdr1 in isolate number 5, the aforementioned mechanisms might have been implicated in the drug resistance. Collectively, the above observations suggest that cyp51A and mdr1, other genes and loci are responsible for voriconazole resistance in A. flavus. 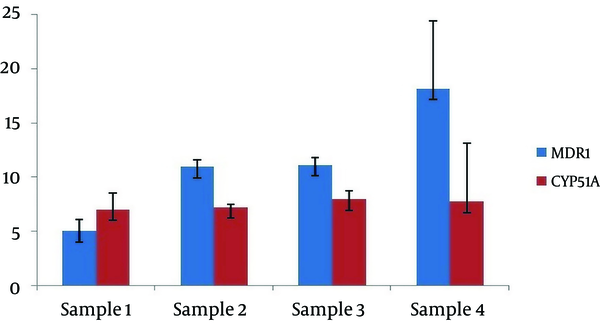 These data suggested that more investigation should be done on larger samples. The authors would like to express their gratitude to Dr. Hossein Mirhendi, Mrs. Fatemeh Karami, Mrs. Mandana Afshar Pad and Dr. Hoda Abedkhojasteh for their kind cooperation. The Authors acknowledge the Vice Chancellor for Research at the Tehran University of Medical Sciences and Health for their financial support. This research was supported by the Tehran University of Medical Sciences and Health Services (grant number 23864). Authors’ Contribution: Azam Fattahi, Mansour Heidari, and Farideh Zaini: contributed to concept and study design, analysis of data, and supervision of sections of the study; Azam Fattahi and Roohollah Fateh: carried out molecular and susceptibility testing of antifungal drugs experimentation; Azam Fattahi and Roohollah Fateh were responsible for the molecular studies, sequence alignment, and analysis of the data; Ali Kanani was assisted with molecular genetics; Shirin Farahyar, Parivash Kordbacheh, Sasan Rezaie and Mahin Safara: provided scientific advice; Azam Fattahi prepared the manuscript which Mansour Heidari and Farideh Zaini critically revised. All authors read and approved the final manuscript. Funding/Support: This research was supported by the Tehran University of Medical Sciences and Health Services (grant number 23864).